During the rubber hand illusion (RHI), subjects experience an artificial hand as part of their own body, while the real hand is subject to a sort of 'disembodiment'. Can this altered belief about the body also affect physiological mechanisms involved in body-ownership, such as motor control? Here we ask whether the excitability of the motor pathways to the real (disembodied) hand are affected by the illusion. Our results show that the amplitude of the motor-evoked potentials recorded from the real hand is significantly reduced, with respect to baseline, when subjects in the synchronous (but not in the asynchronous) condition experience the fake hand as their own. This finding contributes to the theoretical understanding of the relationship between body-ownership and motor system, and provides the first physiological evidence that a significant drop in motor excitability in M1 hand circuits accompanies the disembodiment of the real hand during the RHI experience. The feeling of body ownership — that the various parts of your body are all part of you — is something that we typically take for granted. However, brain damage can disrupt this sensation and leave individuals convinced that an arm or a leg is no longer their own. Even in healthy people, the ‘rubber hand illusion’ can temporarily produce a similar phenomenon. Individuals watch a lifelike rubber hand being touched while their own hand – which is hidden from view – is touched at the same time. This creates the feeling that the artificial hand has become part of their body, while their real hand is left in a ‘disembodied’ state. How does the brain generate this illusory sense of ownership and accompanying sense of disembodiment? A person’s ability to move their body is thought to contribute to their feeling of body ownership. Therefore, della Gatta, Garbarini et al. asked whether the brain’s ability to move the real hand changes during the rubber hand illusion. In the experiments, the region of the brain that controls hand movement was artificially stimulated in a number of volunteers. When an individual had been primed by the rubber hand illusion to perceive a fake hand as part of their own body, their brain was temporarily less able to activate the muscles of their real hand. This is as if the brain no longer considered the real hand as part of the body. Thus, the altered sense of body ownership experienced during the rubber hand illusion is not a bizarre fantasy, but corresponds to a physiological reaction that accompanies changes in brain activity. The next step is to further define and quantify the relationship between the sense of body ownership and the control of body movement. Specifically, how does activity in the brain areas that control movement contribute to the sense of body ownership? And how do these brain regions communicate with one another to generate a sense of self? The sense of body ownership (i.e. the belief that a specific body part belongs to one’s own body) (Gallagher, 2000) is a fundamental aspect of self-consciousness. Apparently, in normal conditions, the feeling of body ownership does not need any particular explanation; it is immediate and even obvious. However, both pathological cases after brain damage (somatoparaphrenia [Romano et al., 2014] and pathological embodiment [Pia et al., 2016; Fossataro et al., 2016; Garbarini et al., 2013, 2014, 2015; Pia et al., 2013; Garbarini and Pia, 2013]) and experimental manipulations in healthy subjects (e.g. the rubber hand illusion – RHI [Botvinick and Cohen, 1998]) suggest that body ownership, as we normally experience it, is the product of many different and complex operations. It has been suggested that the feeling that our body belongs to us presumably depends on multisensory integration processes arising within a fronto-parietal network, where sensory inputs coming from different modalities are realigned in a unique reference frame (Blanke et al., 2015). Within this network, the ventral premotor cortex seems to play a crucial role, thus establishing, both in monkeys (Graziano, 1999) and in humans (Makin et al., 2008; Ehrsson et al., 2004), an anatomical link between the sense of body ownership and the motor system. Furthermore, it has been proposed that voluntary motor activity of body parts contributes critically to the subjective experience of body ownership (Tsakiris et al., 2010). Within this context, we asked whether the subjective and sometimes illusory sense of body ownership influences objective measures of the sensory-motor system. We took advantage of the RHI paradigm in order to provide a physiological counterpart of the interaction between body awareness and motor control, investigating the relationship between body ownership alterations, such as those occurring during the RHI, and modulation of primary motor cortex excitability. During the RHI, the subject’s real hand is out of view, while a realistic rubber hand (RH) is positioned in its place. When the experimenter synchronously strokes the index finger of both the real and the fake hand, most subjects, after a few seconds of viewing the fake hand’s finger being touched, attribute their tactile sensation to the RH hand, which they start to perceive as their own. During the illusion, the subject’s hand-centered reference frame shifts towards the RH, and so it has been proposed that, as a consequence, the real hand is subject to a sort of disembodiment (Ehrsson et al., 2004). Accordingly, a feeling of disownership of one’s own hand has been reported as an important behavioural component of the RHI (Longo et al., 2008), while a decrease in the temperature of the real (disembodied) hand has been observed as a neurophysiological correlate of the RHI (Moseley et al., 2008). Moreover, it has been demonstrated that cooling the subject’s hand increases the strength of the RHI, whereas warming the hand decreases it (Kammers et al., 2011). However, another study found that hand-cooling can be present in both the experimental (synchronous) and the control (asynchronous) condition, thus suggesting that it is not a reliable correlate of the subjective feeling of hand disownership in the RHI (Rohde et al., 2013). A further study proposed that somatosensory changes observed in the participants' hand while experiencing the RHI can be explained by cross-modal mismatch between the seen and felt position of the hand, and are not necessarily a signature of disownership (Folegatti et al., 2009). In the present study, in the main behavioral experiment, we employed a classical RHI procedure to investigate the presence of the illusory experience in our subject sample. In addition, in the control behavioral experiment, the complementary presence of both embodiment of the RH and disembodiment of the real hand was explicitly investigated. Moreover, during the main physiological experiment, we studied the excitability modulation of motor circuits to the real (stimulated) hand during RHI. While subjects received visual-tactile stimulations, either synchronous (to induce the illusion) or asynchronous (control condition), motor evoked potentials (MEPs) were elicited by a single-pulse of transcranial magnetic stimulation (TMS) over the left primary motor cortex (M1) and recorded from the right first dorsal interosseous muscle (FDI). See details in Material and methods and in Figure 1A. The white square indicates the opening in the experimental wooden box through which the rubber hand is visible to the subject. Subjects could see only the rubber hand being stroked by the experimenter’s right hand. In A, main experiment, MEPs were acquired from the stimulated (right) hand’s FDI muscle; in B, control experiment, MEPs were acquired from non-stimulated (left) hand’s FDI muscle. In C, timeline of the study and experimental conditions are plotted. We hypothesized that, in the motor domain, a disembodiment effect during the RHI might be measurable as a lower excitability of motor pathways to the real hand, i.e. a situation in which a stronger voluntary command is needed to bring enough motor neurons to threshold and thus to elicit movement. Thus, a decrease of FDI MEP amplitude compared to the baseline, specific to the real (disembodied) hand, was expected in the synchronous condition (where the subjects experienced the RHI) and not in the asynchronous (control) condition. Furthermore, according to behavioral studies reporting an increased illusory experience over time (Lewis and Lloyd, 2010; Valenzuela Moguillansky et al., 2013), this inhibitory motor response was expected to increase during exposure to the illusion. Finally, we expected the MEP amplitude decrease to be specific for the stimulated (right) hand, i.e. no amplitude modulation in the non-stimulated (left) hand (see Figure 1B; control physiological experiment). 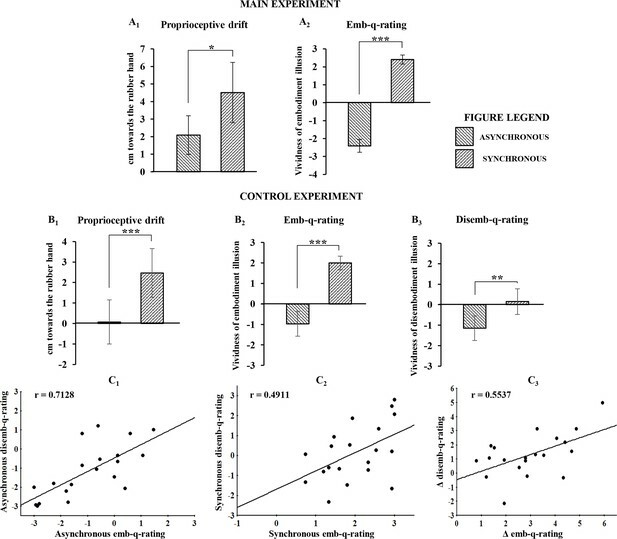 The main behavioral results showed that both proprioceptive drift towards the RH and embodiment questionnaire rating (emb-q-rating) were significantly higher in the synchronous than in the asynchronous condition (drift=mean ± sd: 4.51 ± 4.2 cm vs. 2.08 ± 2.75 cm; t(23)=2.783, p=0.0105, dz=0.58; emb-q-rating=mean ± sd: 2.4 ± 0.64 vs. −2 ± 0.9, Z=4.2857, p=0.000018, dz=3.88; Figure 2A1 and A2; see also Figure 2—source data 1). No significant correlation was found between emb-q-rating and proprioceptive drift. Behavioral results following asynchronous and synchronous condition. The average values for proprioceptive drift and emb-q-rating are plotted in A1 and A2, respectively, for the main experiment, and in B1 and B2, respectively, for the control experiments. In B3 are reported average values for disemb-q-rating. Error bars indicate 95% CI. Significant levels: *p<0.05; ***p<0.0001. Linear regressions between emb-q rating and disemb-q-rating in both syncronous and asyncronous conditions and in the delta syncronous minus asyncronous are plotted in C1, C2, C3, respectively. All subjects behavioural data are available in the additional source data file (see Figure 2—source data 1 and 2). 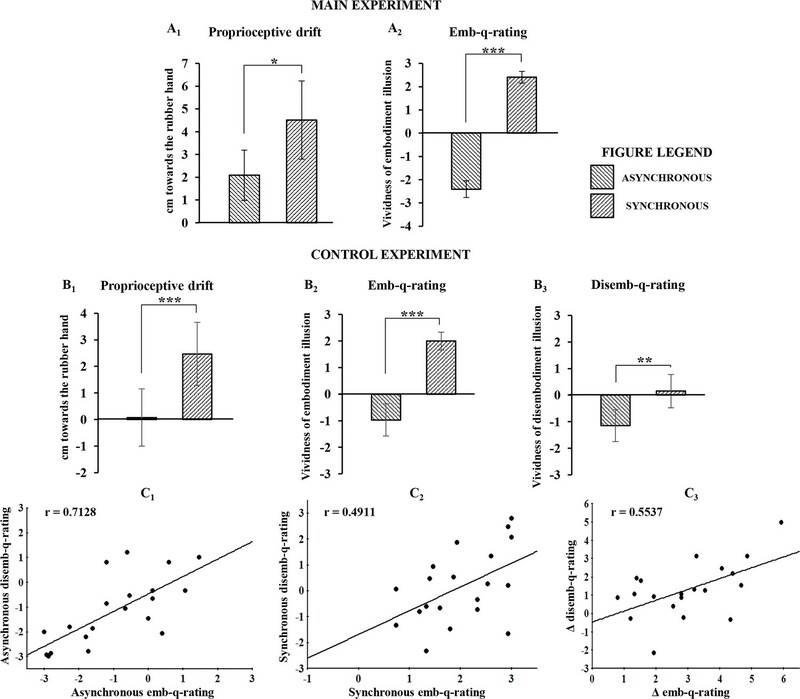 In the control behavioral experiment, similar results were found for both proprioceptive drift and emb-q-rating (drift=mean ± sd: 2.47 ± 2.707 cm vs. 0.075 ± 2.461 cm; t(19)=5.275, p=0.000043, dz=1.18; emb-q-rating=mean ± sd: 2 ± 0.763 vs. −0.97 ± 1.387; t(19)=9.357, p=0.0000001, dz=-2.1; Figure 2,B1 and B2; see also Figure 2—source data 2). Furthermore, the disembodiment questionnaire rating (disemb-q-rating) was significantly higher in the synchronous than in the asynchronous condition (disemb-q-rating=mean ± sd: 0.153 ± 1.427 vs. −1.15 ± 1.371; t(19)=3.835, p=0.00116, dz==0.86; Figure 2,B3; see also Figure 2—source data 2). Finally, significant correlations were found between emb-q-rating and disemb-q-rating in both synchronous and asynchronous conditions and in the delta synchronous minus asynchronous (respectively: r-=-0.4911, p=0.0279; r-=-0.7128, p=0.0004; r-=-0.5537, p=0.0113; Figure 2,C1,C2,C3). No significant correlations was found between proprioceptive drift and either emb-q-rating or disemb-q-rating. For the physiological data, the Friedman non-parametric ANOVA showed a significant effect of condition (χ2 [2, n=24]=9,000,000; p= 0.01111), suggesting a difference between baseline, synchronous and asynchronous conditions, when MEPs were recorded from the stimulated (right) hand. Wilcoxon matched pairs tests, after Bonferroni correction, revealed a significant MEP decrease in the synchronous condition with respect to both the asynchronous (mean ± sd: −0.367 ± 0.362 vs. 0.205 ± 0.395; Z=3.3143, p=0.000919; dz=0.85) and the baseline (mean ± sd: −0.367 ± 0.362 vs. 0.277 ± 0.691; Z=3 .1428, p=0.001673; dz=0.74) conditions (Figure 3A1; see also Figure 3—source data 1). No significant difference was found between asynchronous and baseline conditions (0.205 ± 0.395 vs. 0.277 ± 0.691; Z=0.1714, p=0.863887; dz=0.08). Examples of MEPs recorded from the FDI muscle of a representative subject are shown in Figure 3. Interestingly, the MEP time-course analysis showed that the inhibitory motor response increases over time, with lower values measured at each time-point. Note that Wilcoxon matched pairs tests, after Bonferroni correction, showed a significant difference between TIME 1 (first five trials) and TIME 4 (last five trials) (mean ± sd: −0.23963 ± 0.425821 vs. −0.5481 ± 0.394248; Z=2.942857; p=0.003252; dz=0.72), Figure 3A2; see also Figure 3—source data 1. Physiological results for the baseline, asynchronous and synchronous conditions. Average MEP amplitude variation in the FDI muscle recorded across all subjects are plotted in A1, for the main experiment, and in B1 for the control experiments. Histograms represent the peak-to-peak MEP mean amplitude (normalized) ± 95% CI in the baseline, asynchronous and synchronous conditions, respectively. Significant levels: **p<0.005; ***p<0.0001. Average MEP amplitude profile recorded across all subjects in the synchronous condition areplotted in A2 for the main experiment and in B2 for the control experiment; points represent the peak-to-peak MEP mean amplitude (normalized), ± 95% CI, at four time-points after induction of the illusion (90 s, 180 s, 270 s 360 s); significance level: **p<0.005. Examples of average raw MEPs recorded from two representative subjects (for the main and control experiments) in the baseline (main: 609 µVolt; control: 619 µVolt), asynchronous (main: 771 µVolt; control: 601 µVolt) and synchronous (main:150 µVolt; control:583 µVolt) conditions. All subjects' physiological data are available in an additional source data file (see Figure 3—source data 1 and 2). By contrast, in the control physiological experiment, in the three-level one-way ANOVA, no significant effect of condition was detected (F(2,38)=0,894943; p=0.417068), suggesting that for the non-stimulated (left) hand there is no difference between the synchronous condition and either the asynchronous (mean ± sd: −0.104 ± 0.399 vs. 0.045 ± 0.262; p=0.820737; dz=0.26) or baseline (mean ± sd: −0.104 ± 0.399 vs. 0.0572 ± 0.368; p=0.711483; dz=0.22) conditions (Figure 3B1; see also Figure 3—source data 2). Moreover, in the four-level one-way ANOVA adopted for analysis of MEP time-course, no significant effect of TIME was found (F(3,57)=0,842673; p=0.476191), suggesting that in the non-stimulated (left) hand, MEP amplitude is not modulated over time (Figure 3B2; see also Figure 3—source data 2). Additionally, the Mann-Whitney U-test revealed a significant difference between the delta synchronous minus asynchronous obtained in each experiment, showing a strong physiological effect of the RHI in the main compared to the control experiment (mean ± sd: −390.746 ± 591.662 vs. − 49.0296 ± 238.332; Z=2.074180; p=0.038063). In the present study, in order to investigate the link between body-ownership and motor system, we took advantage of the well-established RHI paradigm (Botvinick and Cohen, 1998; Ehrsson et al., 2004; Tsakiris et al., 2010; Longo et al., 2008; Moseley et al., 2008; Kammers et al., 2011; Rohde et al., 2013; Folegatti et al., 2009; Lewis and Lloyd, 2010; Valenzuela Moguillansky et al., 2013; Tsakiris and Haggard, 2005), a useful tool to manipulate the sense of body ownership in normal subjects. In the main behavioral experiment, our data show a very strong embodiment effect in the synchronous condition (with a mean rating of 2.4, on a scale of −3 to +3), while none of the subjects reported the illusory experience in the asynchronous condition (with a mean rating of −2, on a scale of −3 to +3). A complementary disembodiment effect (Longo et al., 2008) was investigated and measured in the control behavioral experiment, showing a significant correlation between the reported ownership of the fake hand and disownership of the subject’s own hand. Most importantly, the physiological results provide the first evidence that, during the RHI, the motor excitability of corticospinal hand circuits for the real stimulated hand is greatly reduced. This effect is absent for the real non-stimulated hand. In addition, consistent with behavioral studies reporting an increased illusory experience over time (Lewis and Lloyd, 2010; Valenzuela Moguillansky et al., 2013), the time-course analysis revealed that motor cortex excitability decreases as time of exposure to the illusion increases. The link between body ownership and motor system activation has been investigated with different behavioral paradigms within the RHI framework. Recently, using a moving version of the RHI, it has been shown that voluntary (but not passive) movement of the real hand decreases the perceptual shift towards the rubber hand, suggesting that the subjective sense of agency strongly contributes to a coherent sense of body ownership (Tsakiris et al., 2010). On the other hand, patients with schizophrenia, who show a specific deficit in predicting the consequences of their voluntary actions (Voss et al., 2010), as well as an altered sense of agency (Garbarini et al., 2016; Daprati et al., 1997; Maeda et al., 2012), are more susceptible to the RHI (Peled et al., 2003; Asai et al., 2011; Thakkar et al., 2011). Other studies on clinical populations with movement disorders suggest that patients with focal hand dystonia (Fiorio et al., 2011) or partial or complete paralysis because of spinal cord injury (Scandola et al., 2014; Tidoni et al., 2014) seem to have some impairment of body ownership, according to their susceptibility to the RHI paradigm. A recent study (Burin et al., 2015), investigating the RHI in movement disorder after brain-damage, shows that hemiplegic patients display a weaker/more flexible sense of body ownership for the affected (paralyzed) hand (where the strength of the RHI is increased) when compared to controls, but an enhanced/more rigid sense of body ownership for the healthy hand (where the strength of the RHI is decreased). In other words, the prolonged absence of movement makes the paralyzed limb more readily disowned, while the healthy limb seems to be more strongly owned. Furthermore, other studies (Kilteni et al., 2016; Schütz-Bosbach et al., 2006) have investigated the modulation of corticospinal excitability during different experimental manipulations related to the sense of body ownership, though none with the specific hypothesis of linking a decrease in subjective ownership with a decrease in motor excitability. Kilteni and colleagues (2016) found that healthy people can experience a pseudo-amputation illusion during a virtual reality procedure, suggesting that this experimental manipulation causes corticospinal excitability changes in muscles associated with the virtually amputated body-part. Schütz-Bosbach and colleagues (2006) studied how an action observation task can induce different changes in corticospinal excitability, depending on the level of ownership experienced with respect to the observed moving hand. Ownership was previously manipulated using the RHI procedure: after asynchronous stimulation, observing others’ actions facilitated the motor system, whereas after synchronous stimulation, identical observed actions, now illusorily attributed to the subject's own body, evoked smaller MEPs. In light of our findings, the absence of facilitatory effect during observation following synchronous stimulation can be interpreted as resulting from the decreased corticospinal excitability induced by the illusion. Taken together, these results suggest that body ownership and the motor system are mutually interactive and both contribute to the dynamic construction of bodily self-awareness in healthy and pathological brains. In the present study, we found that the excitability of motor pathways in response to stimulation of the real (disembodied) hand is significantly decreased (i.e., MEP amplitude was significantly reduced) when subjects experience the artificial hand as their own. This suggests that an experimental manipulation of the sense of body ownership is accompanied by a coherent modulation of the motor system. However, as the experimental design was not suited to investigate correlations (see details in Material and methods), the present data do not allow us to address the question of whether subjects who experience a larger subjective illusion also show a larger decrease in MEPs. The presence or absence of linear correlations between MEP amplitude and behavioral measures, including both embodiment of the rubber hand and disembodiment of the real hand, will be investigated in future studies, in which physiological parameters of responder and non-responder subjects can be also compared. It has been suggested that active movements integrate distinct body parts into a unitary body representation (Tsakiris et al., 2010). When this unified representation is altered, as during the visual-tactile conflict induced by the illusion, the excitability of the primary motor cortex is also altered, suggesting that the motor readiness of the real (disembodied) hand could also be reduced. We ascribe the excitability decrease in the primary motor cortex (M1) to cortical inhibitory processes tied to the central processing of hand ownership, possibly reaching M1 via inhibitory input from the premotor cortex (which is known to play a crucial role in the multisensory integration processes that give rise to the sense of body ownership) (Ehrsson et al., 2004). The present findings, which shed new light on our understanding of the different aspects that contribute to the formation of a coherent self-awareness, suggest that bodily self-consciousness strictly depends on the possibility of movement. The bodily self is primarily and originally construed in terms of motor potentiality for actions (Gallese and Sinigaglia, 2010) . If I believe that the hand is mine, then I must be ready to use it; if not, then the activity of the motor system is accordingly down-regulated. Twenty-six (ten male) volunteers took part in the behavioral main experiment (mean age ± SD=24 ± 5 years) (the sample size estimation was performed according to an a priori power analysis, see details in Supplementary file 1). Additionally, a different sample of 26 subjects (ten male) (mean age ± SD=24 ± 4 years) were recruited for the behavioural control experiment. Subjects participated in the physiological experiments only if, in the embodiment questionnaire, they gave a rating higher than zero in the synchronous condition. According to this criterion, 24 out of 26 subjects participated in the physiological main experiment; 20 out of 26 subjects participated in the physiological control experiment. All participants were right-handed, as assessed with the Edinburgh Handedness Inventory, and were screened to exclude a family history of psychiatric, neurological or medical disease. The experimental protocol was approved by the Ethics Committee of the University of Milano and written informed consent was obtained from each subject in compliance with the rules of the 1964 Declaration of Helsinki. In both main (Figure 1A) and control (Figure 1B) experiments, the RHI was evoked by the synchronous stroking of the rubber hand and of the participant’s own hidden hand (the location of stroking on the two hands was carefully matched) using the traditional visual-tactile stimulation (Botvinick and Cohen, 1998). Asynchronous stroking of a participant own hand and the rubber hand was utilized as a control condition, in which strokes were delivered spatially and temporally out of phase between the two hands. Participants sat with their forearms resting on a table, with their right hand inserted, palm down, in one of two identical compartments of a wooden box (59 cm × 33 cm × 15 cm); the rubber hand was placed in the left compartment, in egocentric position and aligned with the participant’s shoulder. The upper lid of the box could be lifted or lowered to either reveal or occlude the participant’s view of the rubber hand in the left compartment, while his/her right hand was always out of view. The participant was able to see only the rubber hand being stroked by the experimenter’s right hand, while the subject's right hand and the experimenter’s left hand were always out of subject's view. The distance between the index finger of the rubber hand and the participant’s own right index finger was 20 cm. A cloth was placed so as to hide both the participant’s shoulder and the proximal end of the rubber hand. The behavioral RHI effect was measured in two ways: (1) by asking participants to localize the position of their unseen hand along the horizontal plan in front of them, and thus obtaining a measure of the proprioceptive drift towards the rubber hand, (2) with a questionnaire investigating their feeling of ownership of the rubber hand as a consequence of the experimental manipulation. Moreover, in the control experiment, we also measured the disembodiment experience of the stimulated hand with a questionnaire investigating the feeling of loss of own hand (Longo et al., 2008). The physiological effect was measured by recording motor-evoked potentials (MEPs), utilized to evaluate the excitability modulation of cortical and spinal motor neurons during the RHI. In the main experiment, MEPs were recorded from the real stimulated (right) hand, while in the control experiment, MEPs were recorded from the contralateral non-stimulated (left) hand. 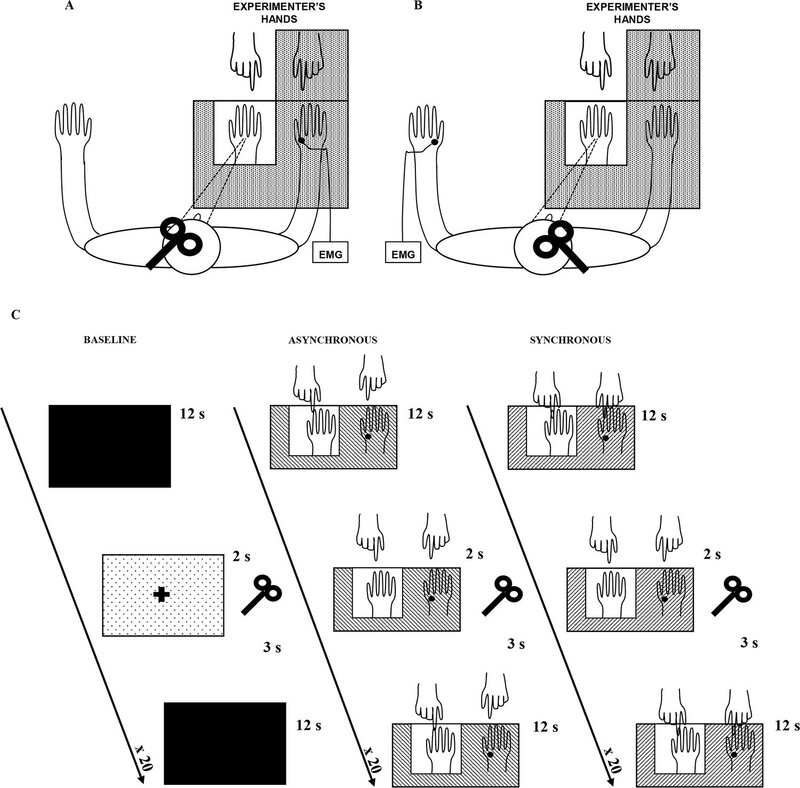 Behavioral and physiological experiments were done in separate sessions: recording of MEPs in the three experimental conditions required about 40 min, and inserting the hand-ownership evaluation questions would have prolonged the experiment beyond a reasonable and feasible time, increasing the probability that subjects move their head with respect to the coil or lose their concentration on the task. In the main experiment, MEPs were elicited by single-pulse transcranial magnetic stimulation (TMS) of the hand area in the left M1 and recorded by self-adhesive bipolar surface electrodes that were placed over the belly of the right first dorsal interosseous muscle (FDI). Electromyographic (EMG) signals were amplified, filtered (10 Hz to 1 kHz), digitally converted (sampling rate 5 kHz) and stored in a computer for offline analysis. The head of each subject was restrained by a comfortable pillow wrapping around the neck and supported by a fixed head rest. A mechanical arm held a figure-of-eight-shaped coil connected to a magnetic stimulator (Magstim 200; Magstim Co. Ltd, Whitland, UK; maximal power 2.2 T). The coil was positioned and fixed on the left primary motor cortex with the handle pointing backwards at 45% from the midline so as to activate the selected muscle, and the stimulator output was set at about 110% of each subject’s motor threshold (defined as the intensity giving three MEP responses out of six stimuli) (Rossini et al., 1994; Borroni et al., 2008). The absence of voluntary contraction before each TMS pulse was verified by continuous monitoring of the EMG signal. We replicated the same procedure in the control experiment, but in this case, MEPs were elicited by single-pulse TMS of the hand area in the right M1 and recorded with self-adhesive bipolar surface electrodes over the left FDI belly. At the very beginning of each experiment, after they gave their informed consent, subjects were asked to watch a cross on a pc screen while sitting in a comfortable chair. In the meantime, 20 MEPs were recorded (without visual-tactile stimulation) and taken as a measure of motor-cortex excitability in a neutral condition. In both main and control experiments, participants were asked to judge the perceived location of their unseen right index finger by verbally indicating a number on a ruler presented on top of the box in front of them. This was repeated for 10 trials, and in each trial the ruler was shifted horizontally so as to avoid the subjects' basing their answers on a fixed reference point, rather than on their actual proprioceptive judgment. The difference between the indicated location of the participant’s right index finger before and after the visual-tactile stimulation was taken as a measure of perceptual relocation. In order to evaluate the subjective experience of the RHI, an ownership questionnaire (emb-q-rating) consisting of three statements was administered; participants were asked to evaluate the vividness of their experience of ownership of the rubber hand using a 7 points Likert scale (–3=strong disagreement; +3=strong agreement; 0=neither agreement nor disagreement), with the following three items: “It seemed as if I were feeling the touch in the location where I saw the rubber hand touched”, “It seemed as though the touch I felt was caused by the touch over the rubber hand”, “I felt as if the rubber hand were my hand”. The statements were based on the traditional RHI study (Botvinick and Cohen, 1998). This behavioral part was performed both to replicate results found in previous studies (Botvinick and Cohen, 1998; Ehrsson et al., 2004; Tsakiris et al., 2010; Longo et al., 2008; Moseley et al., 2008; Kammers et al., 2011; Rohde et al., 2013; Folegatti et al., 2009; Lewis and Lloyd, 2010; Tsakiris and Haggard, 2005) on the behavioral RH effect and in order to include in the study only those subjects who experienced the illusion (with ratings higher than zero in the synchronous condition). Note that, according to this criterion, two subjects in the main experiment were not admitted to the physiological experiment. Moreover, in the control experiment, in order to verify whether the feeling of ownership of the RH is coherently accompanied by a feeling of disownership of the stimulated hand, a disownership questionnaire (disemb-q-rating) consisting of three statements was also administered. Participants were asked to evaluate the strength of their disembodiment experience over the stimulated hand using a 7-point Likert scale (–3=strong disagreement; +3=strong agreement; 0=neither agreement nor disagreement), with the following three items: "It seemed like I was unable to move my hand", "It seemed like I couldn’t really tell where my hand was", "I seemed like my hand had disappeared". The statements were selected from a study proposing a psychometric approach to body ownership (Longo et al., 2008). For both main and control experiments, at the end of the behavioral procedure, 20 MEPs were recorded during both synchronous and asynchronous conditions. The order of the experimental blocks (synchronous-asynchronous; asynchronous-synchronous) was counterbalanced between subjects. Participants received an experimental block of 20 visual-tactile stimulations, either synchronous or asynchronous, depending on the random order of the sequence. Each visual-tactile stimulation cycle lasted 12 s. Two seconds after the end of each cycle, a single-pulse TMS was triggered to induce a MEP, using a custom-made synchronizing program in LabView10. After an inter-trial interval of 3 s, the next stimulation cycle started. Therefore, for each subject, 60 MEPs were recorded: 20 during the baseline conditions (at the beginning of the whole procedure) and 40 during the visual-tactile stimulation (20 during the synchronous block; 20 during the asynchronous). Participants were exposed to both experimental blocks (synchronous/asynchronous) in the same experimental session, with a resting break between the blocks (lasting about 5 min). The return of cortical excitability to baseline level was always ascertained before starting each block of visuo-tactile stimulation. The whole experimental procedure, including behavioral and physiological experiment, lasted about 40 min. In both main and control experiments, the mean value of the three ownership statements used in the subjective rating questionnaire, in the synchronous and asynchronous conditions, was obtained and used as a dependent variable (emb-q-rating); in the control group, we also obtained and used as a dependent variable the mean value of the three disownership statements, in the synchronous and asynchronous conditions (emb-q-rating and disemb-q-rating). For the proprioceptive drift, the difference between the indicated location of the participant’s right index finger before and after the visual-tactile stimulation (in both synchronous and asynchronous conditions) was taken as a measure of perceptual relocation, which was averaged and used as a dependent variable. All data were assessed for normal distribution using the Shapiro-Wilk test (p>0.05). In the main experiment, for the emb-q-rating in both synchronous and asynchronous conditions, the residuals were not normally distributed (p=0.00146 and p=0.0092), so the Wilcoxon signed-rank test was used for pairwise comparisons. In the control experiment, in both synchronous and asynchronous conditions for the emb-q-rating (p=0.08448 and p=0.60427) and the disemb-q-rating (p=0.88009 and p=0.34168), the residuals were normally distributed, so comparisons between synchronous and asynchronous stimulations were computed by means of a paired T-test (two tailed). In both experiments, residuals for the proprioceptive drift were normally distributed (main: p=0.91975 and p=0.71247; control: p=0.90201 and p=0.37482), so comparisons between synchronous and asynchronous stimulation were computed by means of a paired T-test (two tailed). For each test performed, we reported mean, standard deviation, p (significance) value and Cohen’s d value (calculated as within-subjects effect sizes using G Power matched pairs statistical tests). All subjects' behavioural data are available in an additional source data file (see Figure 2—source data 1 and 2). MEP amplitude of the FDI muscle was measured as the peak-to-peak distance (in µV), and MEPs of amplitude lower than 50 µV were discarded from analysis (Rossini et al., 1994; Borroni et al., 2008). For each subject, 20 measurements of MEP baseline values were acquired at the very beginning of the experiment in order to provide a reference value that could be used a) to verify that, during the on-line data acquisition, the cortical excitability was unchanged in the second experimental block of visual-tactile stimulation compared to the first one and b) to compare, during data analysis, the obtained MEP values in the experimental blocks (in order to discriminate between facilitation or inhibition effects). Normal distribution of the residuals was checked using the Shapiro-Wilk test (p>0.05), and the appropriate non-parametric tests were applied when one or more of the corresponding data sets failed to meet the criteria for normal distribution. In both experiments, for each subject, we used MEPs recorded in each experimental condition (baseline, asynchronous and synchronous trials, a total of 60 trials), to obtain a grand-mean and a grand-standard-deviation. Then, each single trial was transformed in z-scores, according to the following formula: (x – grand-mean)/(grand-standard-deviation), where x indicates a single trial value. The obtained values were averaged for each subject and entered into two separate (for the main and control experiments) three-level (baseline, asynchronous, synchronous) one-way ANOVAs. In this analysis, for the main experiment, the distribution of residuals in the synchronous condition was not normal (respectively: p=0.70962, p=0.08347, p=0.00604). Thus, we performed Friedman non-parametric ANOVA in order to detect significant differences across the three conditions (baseline, asynchronous, synchronous); therefore, Wilcoxon signed-rank tests were used for pairwise comparisons. Finally, for each pairwise comparison (N = 3), a Bonferroni correction was applied (a value/n of comparisons: 0.05/3 = 0.017). In the control experiment, residuals of the three conditions were normally distributed (respectively: p=0.60988, p=0.44773, p=0.66546) and the ANOVA normality assumption was satisfied. Furthermore, we investigated the time course of MEP change in the synchronous condition of both experiments in order to describe, for each subject, a MEP amplitude time-profile during the illusion. MEP z-scores for all participants were divided into four blocks of five MEPs each. The obtained values were averaged starting from 0 to 5 (TIME 1), from 6 to 10 (TIME 2), from 11 to 15 (TIME 3) and from 16 to 20 (TIME 4), and entered in a four-level one way ANOVA (TIME: one, two, three, four). Residuals for the main experiment were not normally distributed, so Wilcoxon signed-rank tests were used for within comparisons of the four-level time variable; for each pairwise comparison (N = 4), Bonferroni correction was applied (a value / n of comparisons: 0.05/4 = 0.0125). Finally, in order to compare MEP modulation in the two experiments, we avoided classical ANOVA because residuals in the main experiment were not normally distributed. So, we calculated a delta on raw MEP amplitude between synchronous minus asynchronous for all subjects in each experiment; then the obtained values were analyzed with Mann-Whitney U-test. For each statistical test, we reported mean, standard deviation, p value and Cohen’s d (calculated as within-subjects effect sizes using G Power matched pairs statistical tests). All subjects' physiological data are available in additional source data file (see Figure 3—source data 1 and 2). 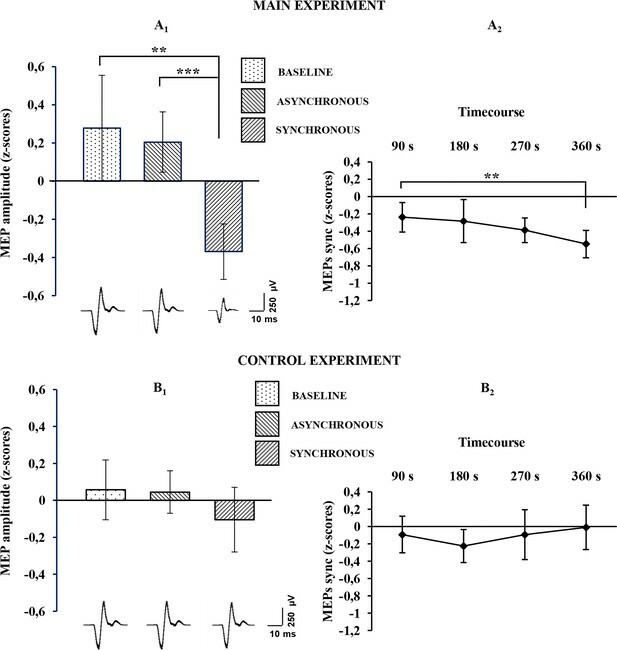 In the main experiment, linear regressions were performed between emb-q rating and proprioceptive drift in both synchronous and asynchronous conditions and in the delta synchronous minus asynchronous. In these correlations, the distribution of residuals, checked with Shapiro-Wilk test, was not normal, so we adopted the Spearman rank-order correlation. In the control experiments, linear correlations were performed between emb-q rating and disemb-q-rating in both synchronous and asynchronous conditions and in the delta synchronous minus asynchronous; moreover, linear regressions between proprioceptive drift and emb-q rating /disemb-q-rating in both synchronous and asynchronous conditions and in the delta synchronous minus asynchronous were performed. In these correlations, residuals, when checked with the Shapiro-Wilk test, were normally distributed. We acknowledge that the present experimental design was not ideally suited to investigate correlations, due to the fact that behavioural and physiological data were acquired in two separate sessions. Indeed, we could not obtain the behavioural responses during the registration of each MEP recording (due to time constraints during MEP acquisition) and, therefore, we could not have a point-by-point matching between those data. Furthermore, only responder subjects were admitted to the physiological experiment, i.e. we use only subjects who gave ratings higher than zero in the synchronous condition in the embodiment questionnaire administered during the behavioural experiment. Thus, in the present sample, which only includes responder subjects, correlations between physiological parameters and the presence/absence of the illusion cannot be investigated. However, to investigate whether responder subjects who experience a larger subjective illusion also show a larger decrease in MEP amplitude, we computed correlations, using either ratings of the questionnaire or proprioceptive drift values. In both cases, we used two different approaches: a) we normalized MEP values, ratings and drift values by using z-scores to compute independent correlations for synchronous and asynchronous conditions: significant correlations with MEPs were not found, neither for questionnaire ratings nor for proprioceptive drift; b) for MEP values, ratings and drift values, we computed a delta (synchronous minus asynchronous) value and performed correlations on these values: again, no significant correlations with MEPs were found for questionnaire ratings or for proprioceptive drift. European Journal of Neuroscience 28:1427–1435. Trends in Cognitive Sciences 4:14–21. Frontiers in Behavioral Neuroscience 10:43. Frontiers in Human Neuroscience 7:737. Frontiers in Human Neuroscience 10:145. Phenomenology and the Cognitive Sciences 9:317–339. Frontiers in Human Neuroscience 7:298. Electroencephalography and Clinical Neurophysiology 91:79–92. Frontiers in Human Neuroscience 8:404. Restorative Neurology and Neuroscience 32:1–12. Journal of Experimental Psychology 31:80–91. Frontiers in Human Neuroscience 7:659. Thank you for submitting your article "Decreased motor cortex excitability mirrors own hand disembodiment during the rubber hand illusion" for consideration by eLife. Your article has been reviewed by two peer reviewers, including Alessandro Farné, as well as Reviewing Editor Jody Culham who also served as Senior Editor. The reviewers have discussed the reviews with one another and the Reviewing Editor has drafted this decision. The authors report an interesting finding on the experimental manipulation of body ownership caused by the rubber hand illusion, the subjective feeling of the 'loss' of the participants' real hand. They report that the illusion results in decreased corticospinal excitability as measured with motor-evoked potentials. The approach demonstrates a new neural correlate of the illusion that provides insight into its effects on the motor system. Specifically, the findings show that the disembodiment of one's own hand is reflected in the motor system (whereas earlier behavioral work has focused on aspects of embodiment rather than disembodiment). As such, the results suggest that we "lose control" of our own hands if we don't feel that they are fully "ours". All reviewers agreed that the paper is likely to make an interesting, timely and insightful contribution to the literature by showing that the rubber hand illusion leads to reduced cortical excitability (motor-evoked potentials) of the real hand. Nevertheless, they raised substantive concerns that would require a new experiment to address. eLife typically tries to avoid requesting new experimental data (and in such cases, the usual outcome is a rejection). However, during post-review discussion, the consensus was that as the paper was sufficiently promising and that the new experiment was likely (though not guaranteed) to work and yield a manuscript that would be publishable in eLife. Thus we encourage you to collect the recommended data and resubmit the manuscript, in which case we will solicit input from the same reviewers. Normally eLife aims to receive revisions within two months but if you expect this to be problematic, you can discuss it with the editor. Alternatively, given the extent of the revisions required, you may decide instead to submit your manuscript to another journal, in which case we ask you to notify us and we hope the reviewers' comments are helpful. The following changes are necessary for publication. All three reviewers noted that the MEP-behavioral correlations were problematic, perhaps because the request after the initial submission wasn't specific enough or the desired analysis didn't work. It appears that the new analysis (Figure 5) simply dichotomized the presence/absence of the illusion (which was essentially driven by the difference between the synchronous/asynchronous conditions) and correlated this with the continuous MEP magnitude. However, this doesn't tell us any more than a simple comparison of MEPs between synch and asynch (Figure 3). If you take a continuous measure of illusion strength for each subject (difference in continuous Q ratings for synch – asynch or difference in proprioceptive drift for synch – asynch) and do a scatterplot against difference in MEPs for each subject, is there a correlation? This would address the question of whether subjects who show a larger effect of the illusion also show a larger decrease in MEPs. This analysis should examine continuous variables, difference scores between synch and asynch, and try it with all the dependent behavioral variables (questionnaire scores and proprioceptive drift). If those analyses don't show significant correlations, that doesn't mean that the paper shouldn't be published, but it may be worth including the analysis as a supplemental figure or a brief text description and tempering the conclusions accordingly. 2) Two reviewers agreed that the manuscript needs to make clearer the distinction between embodiment and disembodiment in the reduced MEPs. The Authors' main conclusion is "… that a significant drop of motor excitability in M1 hand circuits accompanies the disembodiment of the real hand during the RHI experience." (Abstract, last sentence). The behavioural assessment provided here though is about embodiment, not disembodiment, which was not measured. The conclusion is thus drawn somewhat indirectly from the counterpart of disembodiment. Subjects were selected according to their sensitivity to the RHI, so the result that "… all subjects reported an illusory experience in the synchronous and not in the asynchronous condition." (Results, first paragraph) is a direct outcome of the inclusion criteria (subsection “Behavioural measurements”, last paragraph). The paper would be much stronger if measures of disembodiment were included. Others have developed questions that address this (esp. Longo et al., 2008, http://www.ncbi.nlm.nih.gov/pubmed/18262508). The ideal solution would be to run a replication/extension of the experiment that also included questions about disembodiment (and perhaps some control questions to control for demand characteristics). It may also be that there are clearer correlations between the feeling disembodiment (than embodiment) and the decrease in MEPs. 3) Other improvements in experimental design should be included. Ideally, the design should be better suited (a) to examine correlations between MEPs and behavioral measures, (b) to show that the change in MEPs is specific to the disembodied hand by obtaining control MEPs from the other non-stimulated hand, and (c) to collect baseline MEPs while the participants are looking at the rubber hand setup prior to induction of the RHI (rather than while looking at a computer screen). It is not entirely clear how the procedure can take 40 minutes, when adding the time taken by each trial plus the breaks, please clarify. Though mainly a question of terminology, some shortcuts would be best avoided. CSE (from FDI) is likely more than merely, or not that readily transposable to, a readiness to move the hand (e.g., Introduction, last paragraph, but elsewhere in the manuscript). Please clarify some of the methods: how return to baseline was ascertained (subsection “Physiological measurements”); if you collected multiple baseline please provide statistics; the choice for discarding MEP (subsection “Physiological measures and analysis”) should also be clarified, together with the criteria applied to measure Rest Motor threshold intensity; Were MEP values normalised before Z-transformation? One referee reviewed an earlier version of this experiment (n=14) submitted in another journal. In that version, the results were more or less identical with this one (n=24). It was puzzling to see this increase in the sample size and also the reference of the authors that they used an a priori power analysis. Please clarify. In the previous version of the manuscript (n=14) the order presentation of the synchronous/asynchronous blocks was randomized, rather than counterbalanced. Here the authors report that the order was counterbalanced. Can you please confirm that the participants who took part in this study represent a new sample? The authors used a top-up procedure of inducing the RHI, in cycles of 12 sec. Is there an effect of the accumulation of visuo-tactile stimulation? E.g. MEPs profile change as the illusion becomes stronger. The authors should discuss this paper that seems highly relevant: Schütz-Bosbach S1, Mancini B, Aglioti SM, Haggard P. (2006) Self and other in the human motor system. Curr Biol. 16(18):1830-4. They also used MEPs as DV following the RHI, albeit the focus was slightly difference. However, given the conclusions you draw in relation to motor representations, and the findings of that past study, it is imperative that you discuss/contrast the two findings. The figures make it confusing as to whether or not the subject could see the experimenter's hands stroking the rubber and real hands. Figure 1 implies the subject could see both of the experimenter's hands (but usually they only see the one stroking the rubber hand but not the one stroking the real hand) while Figure 4 implies they only saw part of the hand stroking the rubber hand and none of the hand stroking the rubber hand. It's also confusing that the asynchronous case in Figure 4 looks like the real hand is not being stroked at all. Thank you for resubmitting your work entitled "Decreased motor cortex excitability mirrors own hand disembodiment during the rubber hand illusion" for further consideration at eLife. Your revised article has been favorably evaluated by Jody Culham as the Senior editor. 1) Please add a very brief description of the failure to find correlations (as described on the second page of the reply to reviewers). This should be mentioned – not in the main text but in the details at the end (perhaps in the Methods where you discuss why the design was suboptimal for correlations) or as supplemental materials. It's not that it increases the impact of the article, but rather that there is growing awareness in psychology (and hopefully other fields of science) that researchers need to report and acknowledge analyses that didn't work and not just those that did. 2) Although the reply letter seems to have been carefully edited, the manuscript itself was not and contained typos and misspellings. Please proofread the draft carefully before resubmission. “We acknowledge that the present experimental design was not ideal to investigate correlations, due to the fact that behavioural and physiological data were acquired in two separate sessions. […] Thus, in the present sample, only including responder subjects, correlations between physiological parameters and the presence/absence of the illusion cannot be investigated”. “However, as the experimental design was not suitable to investigate correlations (see details in Methods), the present data do not allow to address the question of whether subjects who experience a larger subjective illusion also show a larger decrease in MEPs. The presence/absence of linear correlations between MEP amplitude and behavioral measures, including both embodiment of the rubber hand and disembodiment of the real hand, will be investigated in future studies, which will compare physiological parameters of responder and non-responder subjects”. A) We normalized MEP values, ratings and drift values in z-scores to compute independent correlations for synchronous and asynchronous conditions: significant correlation with MEPs was found neither for questionnaire ratings nor for proprioceptive drift. B) For MEP values, ratings and drift values we computed a δ (synchronous minus asynchronous) and we performed correlations on the obtained δ values: significant correlation with MEPs was found neither for questionnaire ratings nor for proprioceptive drift. For the reasons mentioned above, we did not include these linear correlations in this revised version, but we are willing to include them if, after this clarification, the Editor and the Reviewers still think that this would strengthen the impact value of our study. With respect to the probit regression, we agree with the comment that it does not add significantly new results with respect to the main analysis. The probit model suggests that the subjects’ physiological parameters can significantly predict the presence/absence of the illusory experience, as reported during the behavioural experiment. In other words, this is a confirmative analysis of our main results showing that, starting from MEP values, the model classifies most cases (around 80%) in the correct way, predicting if they correspond to a condition in which the subjects experienced the illusion (synchronous condition) or not (asynchronous condition). For this reason, according to the reviewers’ suggestion, we removed this analysis from the revised version. The Authors' main conclusion is "… that a significant drop of motor excitability in M1 hand circuits accompanies the disembodiment of the real hand during the RHI experience." (Abstract, last sentence). The behavioural assessment provided here though is about embodiment, not disembodiment, which was not measured. The conclusion is thus drawn somewhat indirectly from the counterpart of disembodiment. We agree with this comment and, in the revised Discussion, we acknowledged that in our main behavioural experiment we took for granted the relationship between embodiment of the fake hand and disembodiment of the real hand. Thus, according to the reviewers’ suggestion we designed a control behavioural experiment to explicitly investigate this point. Subjects were selected according to their sensitivity to the RHI, so the result that "… all subjects reported an illusory experience in the synchronous and not in the asynchronous condition." (Results, first paragraph) is a direct outcome of the inclusion criteria (subsection “Behavioural measurements”, last paragraph). We reasoned on this comment and, in the revised version, we included more details about the adopted criterion for the subjects’ selection: only subjects who, at the embodiment questionnaire administered during the behavioural experiment, gave rating higher than zero in the synchronous condition, were considered responder subjects and were admitted to the physiological experiment. According to this criterion, we included 24 out of 26 subjects. See Methods (first paragraph). However, we noticed and reported that in our sample all subjects reported a strong illusory experience in the synchronous condition (with a mean rating of 2.4 out of 3) and they did not report illusory experience in asynchronous condition (none of the subjects gave ratings higher than zero in the asynchronous condition and the mean rating was -2 out of -3). See Discussion (first paragraph). We think that this is not just a direct outcome of the inclusion criterion. Note that, within the other reasons reported above, this inclusion criterion is, in our view, another point against the possibility to investigate linear correlations between physiological parameters and the presence/absence of the illusory experience because all included subjects were responders. See Methods (subsection “Correlation analysis”). Note also that similar criterion for subject selection (only subjects who, at the embodiment questionnaire administered during the behavioural experiment, gave rating higher than zero in the synchronous condition, were considered responder subjects and were admitted to the physiological experiment) was used for the control experiment. According to this criterion 20 out of 26 subjects were admitted to the physiological control experiment. See Methods (first paragraph). According to this suggestion, we recruited a new sample and we performed the required two control experiments, a behavioural control experiment and a physiological control experiment (see below). In the behavioural control experiment, as suggested, we administered the disembodiment questionnaire of Longo et al. (2008) we found a significant disembodiment effect in the synchronous vs. the asynchronous condition and a significant correlation between the embodiment of the fake hand and the disembodiment of the real (disembodied) hand. See the revised Introduction (second paragraph), Methods (subsection “RHI experimental procedure”; subsection “Behavioural measurements”, last paragraph), Results (second paragraph) and Discussion (first paragraph). A) In the revised version we acknowledged, as a limitation of the study, that the present design should be better suited to examine correlation; Methods (subsection “Correlation analysis, last paragraph), Discussion (third paragraph). B) In the revised version, we recruited a new sample to performed the required physiological control experiment by recording MEPs from the non-deluded hand and we demonstrated that the change in MEP amplitude is specific to the deluded hand, see the revised Introduction (last paragraph), Methods (subsection “TMS and EMG recordings”; subsection “Physiological measures and analysis”), Results (third paragraph) and Discussion (first paragraph). With respect to the last point (C), we think that recording MEPs while participants are looking at the rubber hand could be another experimental condition, because other studies have shown that only looking at the RH can modulate the subjects’ sense of body ownership, and also affect proprioceptive drift (see references below). However, in our design we focused on the comparison between synchronous and asynchronous condition, while the effect of looking at the RH was controlled, because it was equally present in both conditions. Thus, although the present data cannot exclude that the view of the RH per se can induce a MEP modulation with respect to the baseline, we can exclude that the inhibitory effect we found in the synchronous condition is merely due to observation of the RH during the experiment. Farné, A., Pavani, F., Meneghello, F., & Ladavas, E. (2000). Left tactile extinction following visual stimulation of a rubber hand. Brain, 123, 2350–2360. Pavani, F., Spence, C., & Driver, J. (2000). Visual capture of touch: Out-of-the-body experiences with rubber gloves. Psychological Science, 11, 353–359. Durgin F, Evans L, Dunphy N, Klostermann S, Simmons K (2007) Rubber hands feel the touch of light. Psychol Sci 18: 152–157. Rohde M, Luca M, Ernst MO (2011) The rubber hand illusion: Feeling of ownership and proprioceptive drift Do not go hand in hand. PLoS One 6(6):e21659. doi:10.1371/journal.pone.0021659. The statement is now clarified it in the text, specifying that the entire experimental procedure, including behavioural and physiological experiment lasted about 40 minutes (plus the time for the correct localization of the FDI hot spot in M1, which was variable in each subject, and threshold determination). (Methods, end of subsection “Physiological measurements”). In order to avoid the shortcut, we now refer to “readiness of motor pathways”, a more literal description of a situation in which, with a lower excitability of primary motor cortex, a stronger voluntary command is going to be necessary to bring enough motorneurons to threshold and evoke movement. We did not formally collect multiple baselines. Return to baseline was simply ascertained online by evoking a few MEPs (about 5 on average), without changing intensity of TMS stimulation, before starting each experimental session. It was important to do this between the second and third series of recordings, when subjects had undergone either the asynchronous or, especially, the synchronous stimulation, which could have long-term effects on MEP amplitude (although having the subject take a 5 min resting pause resulted sufficient to prevent this possibility). MEP amplitude is intrinsically rather variable and a precise measure would have indeed required recording a full 20-MEP series and comparing averages and variability; we decided that inserting an additional 20-MEP series would have excessively prolonged the overall experiment at the expenses of data collection in the experimental conditions of interest. Having worked with TMS on M1 for over a decade, we confided in our solid experience in evaluating the quality of the recorded signal. Resting motor threshold (MT) is defined as the minimal intensity required to elicit, with 50% probability, an EMG response of at least 50µV, in a fully relaxed muscle (Rossini et al., 1994), where the 50% probability is often measured as 5 MEPs elicited in 10 consecutive pulses (Rossini et al. 1994), but different numbers have been used, depending on the goal of the study. 3 MEPs in 6 pulses is also common practice (e.g. Borroni et al., 2008). MEPs smaller than 50µV are not considered true motor responses, either because they can be lost in noisy recordings or because at both extremes (very small or very large) MEP amplitude loses it linear relation with stimulus intensity. Rossini PM et al. Non-invasive electrical and magnetic stimulation of the brain, spinal cord and roots: basic principles and procedures for routine clinical application. Report of an IFCN committee. Electroencephalogr. Clin. Neurophysiol. 1994; 91:79–92. Borroni P, Montagna M, Cerri G, Baldissera F. Bilateral motor resonance evoked by observation of a one-hand movement: role of the primary motor cortex. European J Neurosci. 2008;28:1427–1435. Are MEP values normalised before Z-transformation? We used z-transformation to normalize our data, so no previous transformations were performed. In the mentioned version of our study, we performed a similar experiment on a sample of 14 subjects. We received constructive critics on that work in different contexts, including the review processing mentioned by the referee and other comments received during conference meeting presentations. According to these suggestions, we replicated the experiment in a larger sample and we estimated the sample size using an a priori power analysis. With respect to the randomized/counterbalanced problem, if we have had the possibility to answer to the reviewer in the previous revision round, we would have simply acknowledged a mistake in our method description: in both versions of our study, we always used a counterbalanced order. However, the main difference between our previous study on 14 subjects and the present study on 24 subjects is related to the baseline condition. 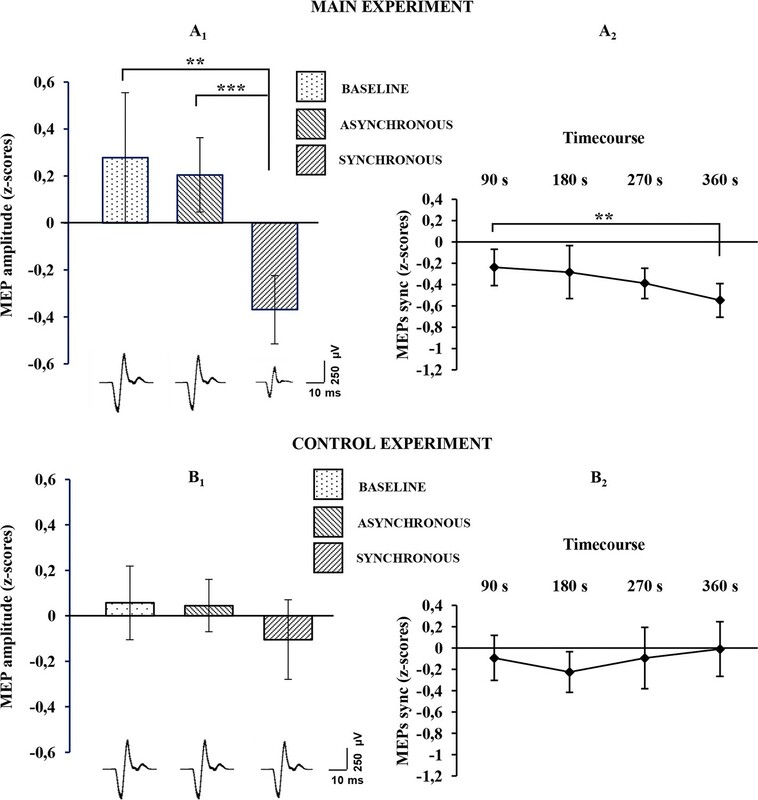 In the previous study we used as dependent variable of the MEP analysis only the synchronous and the asynchronous conditions and we plotted the baseline value as a graphical indication on the modulation direction (inhibition) in the synchronous condition. In that sample, we acquired 5 baseline trials at the beginning of the experiment and we used the mean value to plot the baseline in the graph. However, in the last 8 subjects we also acquired a true baseline condition with 20 trials (as in the synchronous and asynchronous conditions). We did this because, while running the experiment, we realized that a statistical comparison with the baseline could be useful. Then, when we decided that we needed to increase the sample size, we always included a baseline condition with 20 trials (as in the last 8 subjects of our previous study). Thus, in the present sample we included those 8 subjects from the previous data set and 16 new subjects: all performed the same experiment, including the baseline condition with 20 trials. Note that, 18 new subject were recruited for the behavioural experiment (thus, adding the previous 8 subjects, we had a sample of 26 subjects) but 2 out of 18 subjects were not admitted to the physiological experiment because they did not experience the illusion in the synchronous condition (see the above mentioned inclusion criterion to be admitted to the physiological experiment). We thank the reviewers very much for this comment, which allowed us to perform an additional time course analysis of MEP values (see Methods subsection “Physiological measures and analysis”). This analysis showed that, consistent with behavioural studies reporting an increased illusory experience over time (see references below), the inhibitory motor response significantly increases during exposure to the illusion (see Introduction, last paragraph) (see Results, third paragraph). The authors should discuss this paper that seems highly relevant: Schütz-Bosbach S1, Mancini B, Aglioti SM, Haggard P. (2006) Self and other in the human motor system. Curr Biol.16(18):1830-4. They also used MEPs as DV following the RHI, albeit the focus was slightly difference. However, given the conclusions you draw in relation to motor representations, and the findings of that past study, it is imperative that you discuss/contrast the two findings. We added in the Discussion 2 previous studies investigating the modulation of corticospinal excitability during different experimental manipulations related to the sense of body ownership. Together with the suggested Schütz-Bosbach et al. paper, we also mentioned the recently published Kilteni et al. paper. See revised Discussion (second paragraph). We thank the reviewers for these suggestions. As usually done in RHI works, also in our study subjects could only see the rubber hand and the right hand of the experimenter (the one which touches the RH). The participant’s right hand and the left experimenter’s hand were always hidden out from participant’s view. We modified small details in order to make it more intuitively clear (see Figure 1 and capture; see Methods subsection “RHI experimental procedure”). We agree that reporting negative data is important and, according to the Editor’s suggestions, we reported a brief description of the failure to find correlations in methods, where we discussed why the design was suboptimal for correlations. See subsection “Correlation analysis”, last paragraph. We apologize for typos and misspellings. We realized that in our last version of the manuscript the English spell-checker in word processing software was turned off. To edit the present version, we turned on the spell-checker and we carefully revised the English, also according to the Editor’s flagged file. We would like to thank very much the Editor for proofreading our manuscript and including the copy of her revision. It was very useful! Human subjects: All participants gave informed consent. The experimental protocol was approved by the Ethics Committee of the University of Milano and written informed consent was obtained from each subject in compliance with the rules of the 1964 Declaration of Helsinki. © 2016, della Gatta et al. Our brain is less able to move one of our hands if an illusion makes us feel like the hand does not belong to us. The rubber hand illusion and feelings of disembodiment.